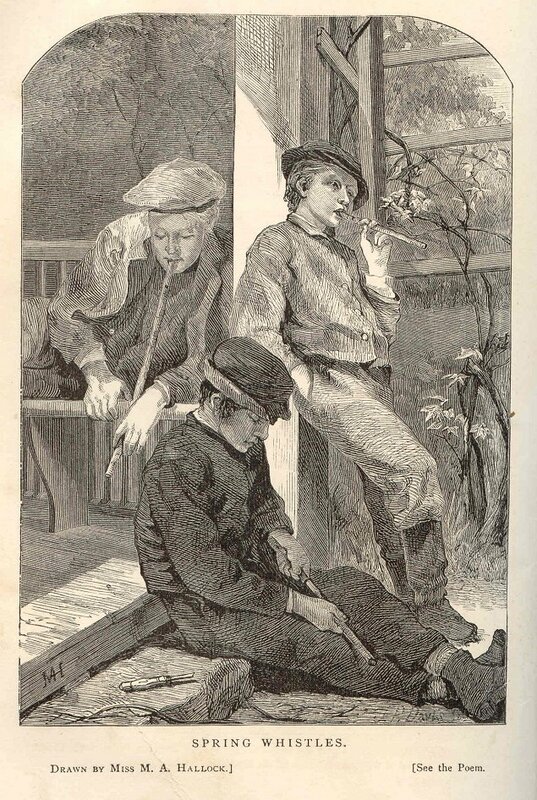 In “Spring Whistles” Lucy Larcom explores the promise inherent in the untried, as three boys joyfully anticipate the sounds their whistles will make. The engraving from an original by Mary Ann Hallock is perhaps the best of her works appearing in Our Young Folks. After cutting a length of green willow and slipping off the bark in one piece, the whistle-maker shaped the wood and slid the bark back over it; the whistle played as long as it stayed moist. Whistles of willow and poplar, Jacob Abbott reminds us in Up the River, could be made only in spring: “ … such whistles can not be made at any other season than in the spring, for that is the time when the alburnum is formed between the bark and the wood, and it is in consequence of the soft and pulpy condition of this alburnum that the bark will separate from the wood so easily. … The place where it is formed is just beneath the bark. It is at first a mere pulpy mass, very soft and full of juice. In the willow and poplar, and in some other trees, it is so soft in the small stems that, by striking upon the bark gently all around with some smooth object, such as the handle of a knife, the alburnum is crushed, and the whole mass becomes soft and slippery, and then the bark can be easily slipped off, and so the whistle can be made.” The seated boy in this engraving is doing just that. Are getting their whistles in tune. Is in the musician’s ear. Their thunder the forest fills. “Whistle, O whistle!” cries Robin. As wait in my whistle for me. Than ever on earth was made.